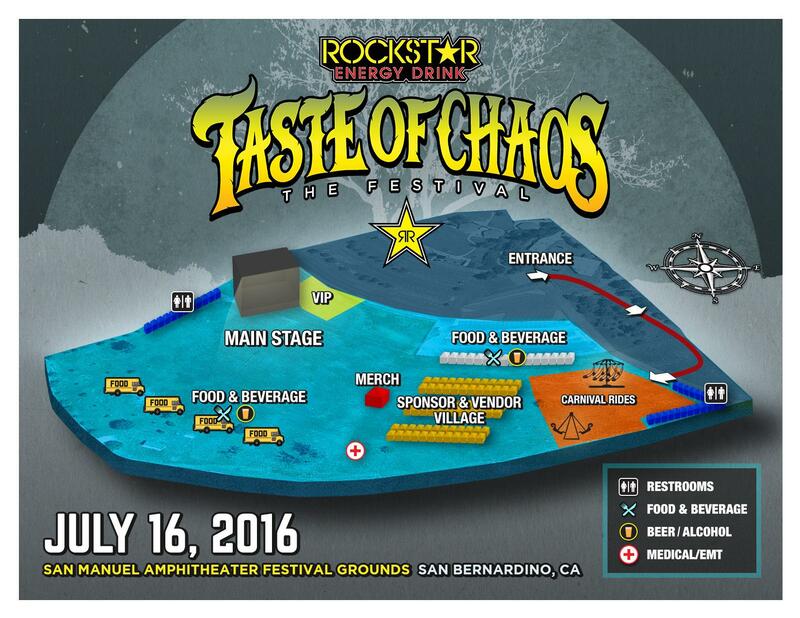 Artist performances times have been announced for the second annual Rockstar Energy Drink Taste Of Chaos Festival on Saturday, July 16th at the San Manuel Amphitheater Festival Grounds in San Bernardino, CA. The day-long destination festival continues to honor the indie-alternative scene's most influential acts, with this year's extraordinary lineup including Dashboard Confessional, Taking Back Sunday, Quicksand, The Get Up Kids, The Starting Line, Saosin (fronted by original vocalist Anthony Green), Senses Fail, The Early November, The Anniversary, Hot Rod Circuit, and Reggie and the Full Effect and more. 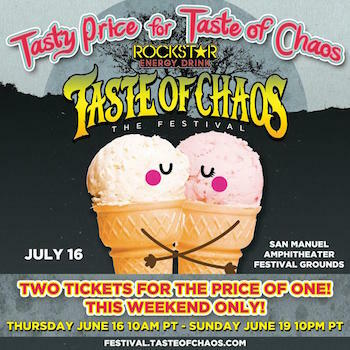 This weekend only, Taste Of Chaos will be offering a special ticketing deal for quite the 'tasty' price. From 10:00 am PT on Thursday, June 16th to 10:00 pm PT on Sunday, June 19th, fans can purchase two tickets for the price of one, at $42.50 total, plus fees. 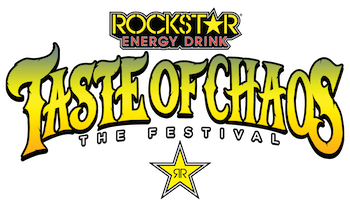 The Rockstar Energy Drink Taste Of Chaos Festival will also include food trucks, craft beer, carnival rides, a vendor village and more. General admission and VIP tickets are available for purchase now at http://festival.tasteofchaos.com/. VIP ticketing includes admission, a fast lane entrance into the festival, a VIP laminate with lanyard, and access to the VIP Lounge (located near the main stage), which will have complimentary select beers, Rockstar Energy Drinks, snacks (while supplies last), private restrooms, comfortable areas to sit and relax, a dedicated cash bar, and access to the Rockstar Energy Drink Taste Of Chaos step-and-repeat logo wall with a photo booth. Attendees must be 21+ to get into the VIP Lounge. 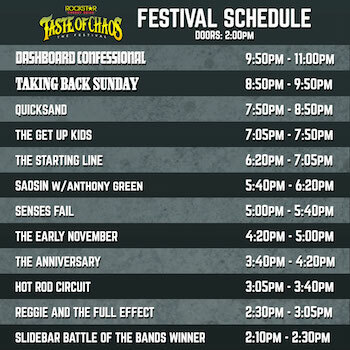 The current band performance times for the Rockstar Energy Drink Taste Of Chaos Festival are as follows (subject to change). Doors open at 2:00 pm. 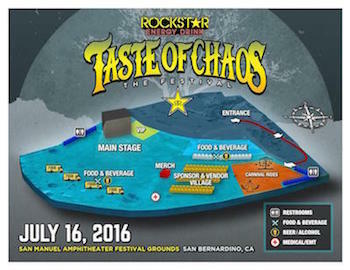 Rockstar Energy Drink Taste Of Chaos Festival at San Manuel Amphitheater Festival Grounds is a short drive from Los Angeles County, Orange County, San Francisco, Las Vegas, Phoenix, Tucson, San Diego, the San Joaquin Valley, and many more cities in the Southwestern U.S.
4Fini is a premier production company and brand strategy firm. The company produces the Vans Warped Tour, the longest running festival tour in North America, as well as Taste Of Chaos, It's Not Dead, and many more music lifestyle events. 4Fini are leaders at integrating brands into an authentic youth experience.